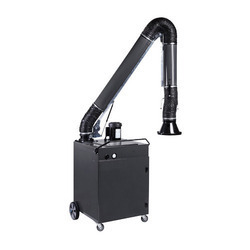 Our product range includes a wide range of fume collector. We are highly engaged in offering Fume Collector. The offered collector is manufactured using finest quality metal and latest technology, under the strict supervision of our qualified engineers. Used in different chemical and welding industries, we manufacture these products with advanced technology. Clients can avail them at very affordable prices from us. The KEMPER Teleskop Absaugarm was for welding booths and welding training courses specifically designed. It can be within his reach in any desired position, the cantilever is maintained due to design its special then. The telescopic arm consists of an inner carrying poles and a polyester fabric hose with PVC coating and welded steel wire spiral. Of course, is also rotating the telescopic arm with 360 ° of the KEMPER exhaust hood with damper. The telescopic arm can with fans or via a pipeline to a central suction and filtration system combine. The KEMPER Teleskop Absaugarm was for welding booths and welding training courses specifically designed. It can be within his reach in any desired position, the cantilever is maintained due to design its special then. The telescopic arm consists of an inner carrying poles and a polyester fabric hose with PVC coating and welded steel wire spiral. Of course, is also rotating the telescopic arm with 360 ° of the KEMPER exhaust hood with damper. The telescopic arm can with fans or via a pipeline to a central suction and filtration system to connect to. Looking for Fume Collector ?